Success in mastering any language requires knowledge in speaking, reading, and writing the language. The speaking component requires the understanding and use of correct pronunciation, emphasis, and syntactic patterns. The written component requires mastery of the alphabet, spelling, and the ability to write, print, or type the pattern. Very early in the learning process, speakers of the English language become keenly aware of the language's lack of sound to symbol correspondence. To help speech/language researchers, media personnel, individuals learning English as a second language, and others interested in correct pronunciation, the International Phonetic Alphabet (IPA) was devised. Extensively class tested, this book offers a practical understanding approach to phonetics and the IPA in a workbook format. It will be welcomed by professionals, students, and trainees in the fields of communication science, communication disorders, speech pathology, and linguistics. Contents: Preface. 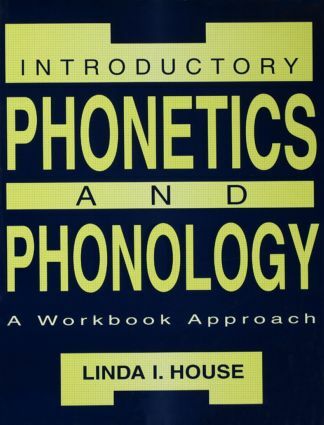 Part I: Understanding Phonetics and Phonology. The Basis of Phonetics and Phonology. Anatomical and Physiological Correlates. Vowels. Diphthongs. Consonants. Single Phoneme and Phonological Development. Part II: Stress and Theory. Coarticulation. Syllable Stress. Narrow Transcription and Factors Influencing Pronunciation. Sentence Stress. Standards of Pronunciation and Dialects. Appendices: Background of the English Language. Old English. Middle English. The Modern Period. Alphabets, Writing, Spelling, and Dictionaries Throughout the Years. Loanwords.